The Cash view shows details of all of the credits and debits that have been recorded over the lifetime of your portfolio. From here you can click the pale green Cash button. 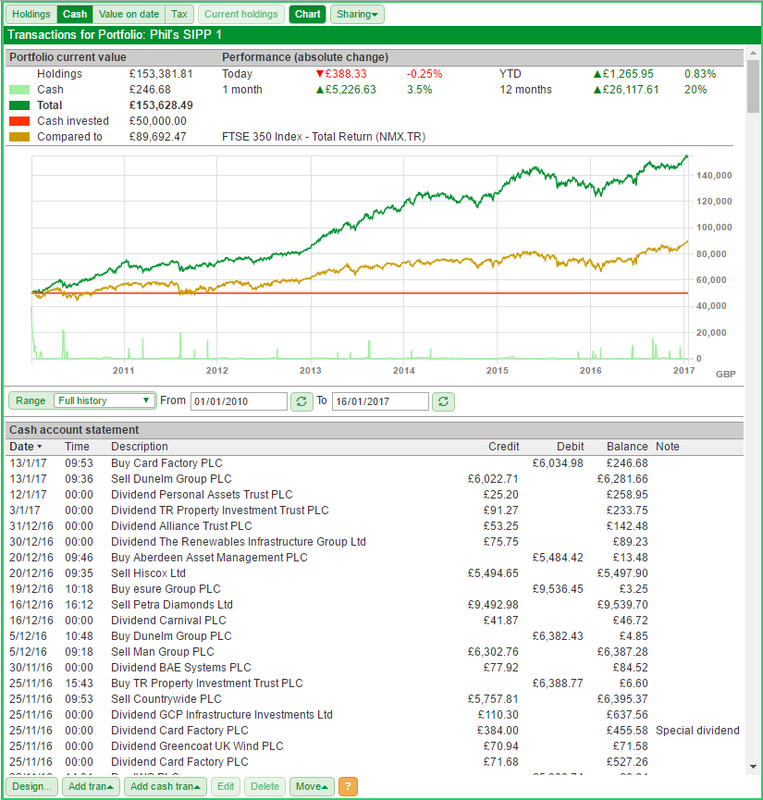 At the top of the Cash view is the same summary view which can be found on the Holdings view. This shows the current value of the portfolio and the performance of the portfolio over various time periods. If you have selected to draw a comparative line on the chart, this will show how the investment would have performed had you invested your cash position into that instrument instead. 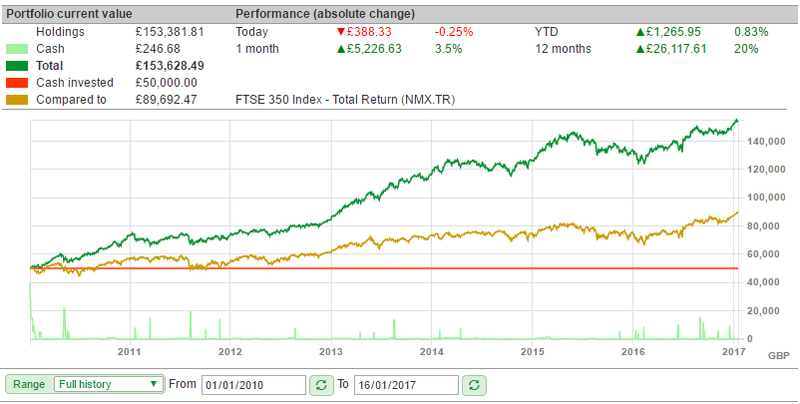 In this example, the portfolio has strongly outperformed the FTSE 350 Total Return index. In addition, you can also select the option to show how much cash has been invested into the portfolio. 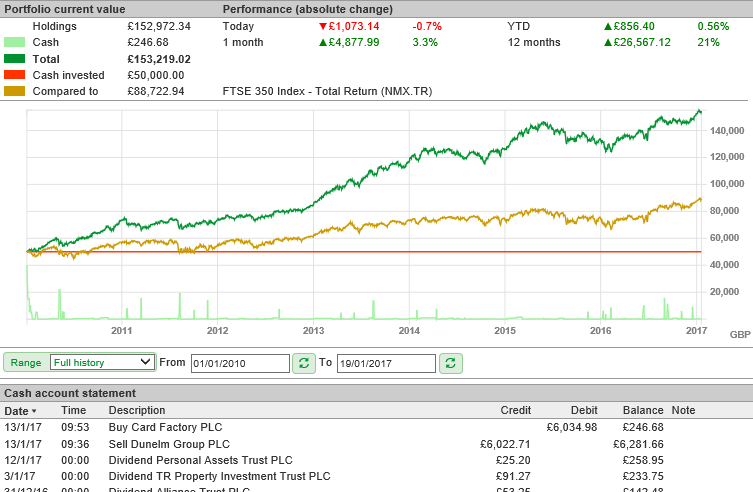 In the above example, the portfolio started with an initial credit of £50,000. Below the summary is a chart of the portfolio's performance. For more information about how to use the chart, please click here. Below the chart is the Cash table, which shows the record of your credits and debits. This can be sorted by any of the columns shown on the table. For example, you might want to sort the table by the Note column. Any transaction can have a note applied to it. In this case the Special Dividend notes have been applied by the Automatic dividend process and the Return of Capital note entered when manually recorded. When sorted by Date, the balance column shows how the balance of the cash has changed with every credit and debit and so will also show your current cash balance. This value is also visible on the summary section at the top of the screen.